There are certain spots in Hoboken that just seemed cursed. No matter what moves into the spot, no matter what they do, it’s just not going to work out. Even if they re-do the insides, put up a new sign, try and change the whole image of the space, typically nothing can break the curse of the property. However, I must finally say that curse of 230 Washington has been lifted with Hoboken Bar and Grill. Hoboken Bar and Grill moved into the spot next to McDonald’s on Washington between 2nd and 3rd (much closer to 3rd) in early 2009 ending a revolving door or restaurants and bars that attempted to make it work with Hoboken’s fickle clientele. It was Rodeo Bar, Privee, and Mercy Grill all within a few years. I think one was a dive bar, one was a prix-fix only restaurant, and then a bar that didn’t know what kind of bar it wanted to be. But none left a lasting impression on Hoboken’s night life. Being next to the McDonald’s is actually sort of a detriment, and I think it is what has hurt most of the previous tenants of the space. 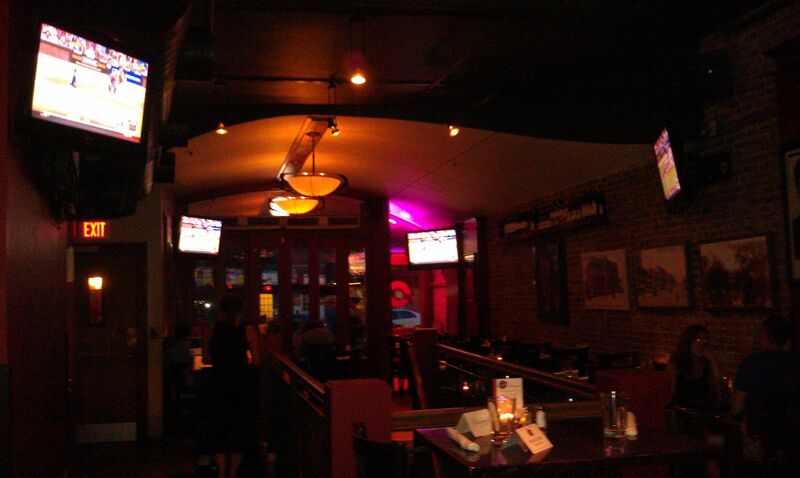 However, Hoboken Bar and Grill (or as I affectionately call it HOBAG) really has made the most of its space. Outside on the recent stretch of beautiful days, their tables out on the sidewalk tend to fill up with people grabbing a bite or having a drink. I went inside after having a tough time actually finding the door to get in because I kept confusing the floor to ceiling windows with the door. 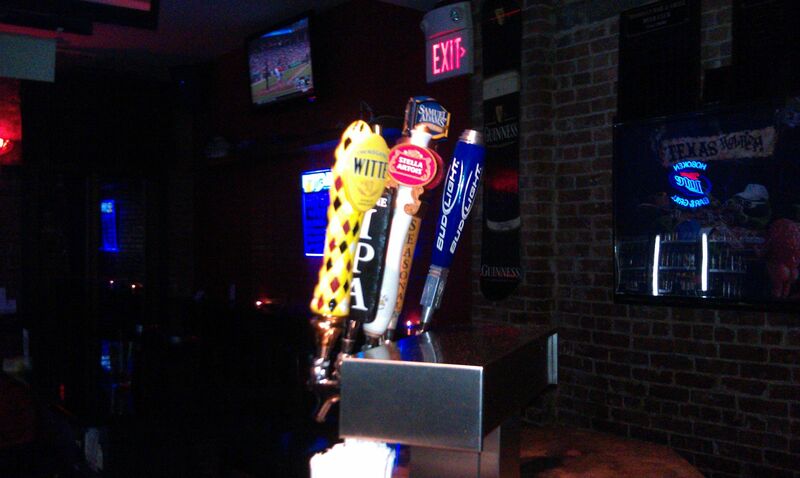 I climbed up to the bar and realized that HOBAG probably has the largest beer selection in all of Hoboken. To encourage people to try numerous beers they offer they have a beer club, which with a list of at least 150 it seems pretty daunting. Shockingly there were quite a few names on the plaques signifying that they have achieved the unthinkable. As part of the beer club you get discounts on food, drinks, some additional specials and you get entered in some drawings. It’s a pretty good idea by the managers to institute this beer club in order to garner some customer loyalty and build a steady customer base on Washington Street which is always tough. While most of the beers on the list are in bottles, HOBAG does have a pretty decent number of beers on tap. For this visit I went with the Alagash White, one of my favorite summer beers. When you walk into Hoboken Bar and Grill you enter past a few of the dining tables and end up at the circular inside bar with TVs in view in every direction. This was a Sunday night so it was kind of quiet but I can see that on football Sundays all the seats at the bar would be taken, as would all of the tables in the front of the place. I noticed when I visited the restroom that there is a large party room downstairs. I don’t know if they ever really have the crowd to use this as an overflow room, but they do have a small bar down there, so if you are looking to throw a private party, it’s good to know that they have the space. The bartender was friendly as was the manager who came over to talk for a bit. Despite the “cursed” location and the opening of a few larger and more bells and whistle sports bars in town, it seems that Hoboken Bar and Grill is here to stay. 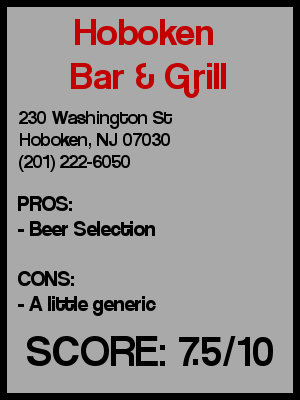 Preconceived notion – Thought it would be your generic sports bar. Crowd stereotype – Mostly in their mid to late 20s. A couple of families grabbing dinner on a Sunday. Music – Seemed like it was 80s Night with the music, heard a little Journey, a little REO Speedwagon, etc. Value – They didn’t have any specials when I was there, and the beer was moderately priced. They do advertise a good number of specials on their website, so be sure to check there and go when the time is right. Date – It would be pretty good for a nice casual date. It was a little too empty for me, but it was an odd time on a summer Sunday. On the bigger going out nights it would be a nice place. Not overly impressive but not pretentious either. Hookup – Don’t think so. First or last drink of the night – It’s a good place to get into easily and grab a couple of quick drinks. 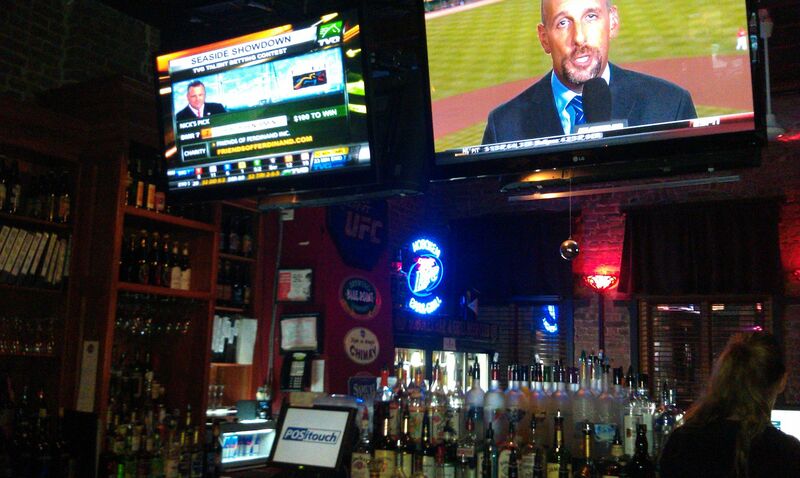 Overall – Hoboken has no shortage of bars with big new TVs showing all of types of sports. What separates this place from the others is that they have their beer club (and its corresponding extensive beer list), and their bartenders and managers are really approachable. Some of those other places are always packed and the bartender just rushes to give you your order so they can move onto the next one. Maybe it was just a quiet night, but that actually made it more enjoyable. I’ll give it a 7.5.